Welcome an updated and simplified version of your control panel, a mobile version of PaperWritings.com — Paperwritings Essay App. Over 100 clients have already been using our app to track all their orders via a smartphone. Learn more and join them today! 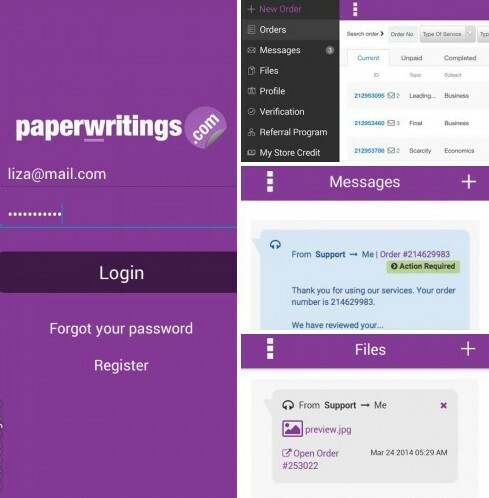 Here we go today with a small review of Paperwritings Essay App that has been so popular among our clients. That’s not surprising considering how our app for Android devices simplifies their experience with our website. If you are not using it yet, it’s high time to learn how it works and try it out! 1. 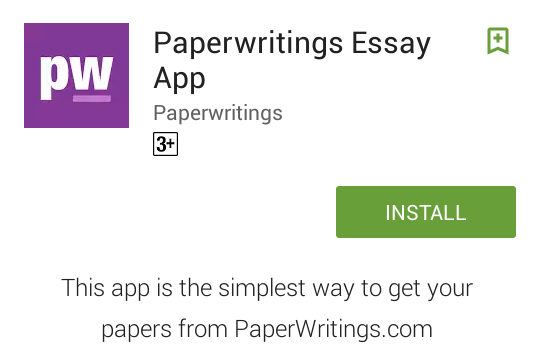 Go to Google Play and install Paperwritings Essay App for free. Make sure that 1.93 MB of your smartphone’s memory is free. 2. Press “Install” and then “Accept” an access request to download the app in seconds. 3. Open it and start your investigation, it takes only a minute. Navigation is so simple! First, get registered if you are a new client at PaperWritings.com or go on to login if you already have an account. You are in! An order page shows up, so you can proceed with your order right away or go and see other features from out here. Want to see the full Menu? Move the screen with your finger to the right or tap it at the top-left corner. Want to go back to your order? Choose “Orders” section or simply click on the cross at the top-right corner. Click on the image below to see its full size. The Menu inside the App contains the same sections as a desktop version, except “My Bonuses”. Still, it remains easy to track all your orders, manage your messages, and get files on a mobile version, because the control panel screen is totally adapted to the responsive design. - Receive instant notifications of all your orders’ statuses. - Get a one-tap access to your control panel whenever you are. - Upload additional materials for your writer right from your phone. - Pay in seconds with your bonuses through the Store Credit section. - Chat with your writer, discuss the details about your order. - See all the earnings with our Referral Program. - Contact our Customer Support Representative immediately. Find your own benefits by using our app and tell us about your experience! Yes, remember to rate our app! Download here.